I saw this recipe at the back of a magazine which I read every month. Lemon & Basil Granita! 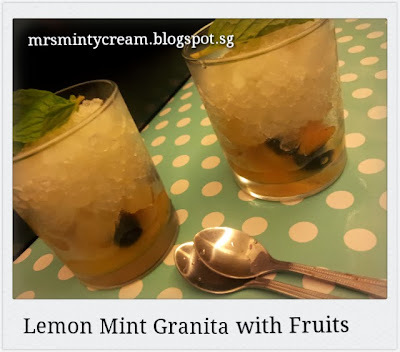 Basically granita is a Italian frozen dessert which is related to Italian ice and sorbet. It is not as compact as the sorbet but still provides that cooling kick you need on a hot afternoon. 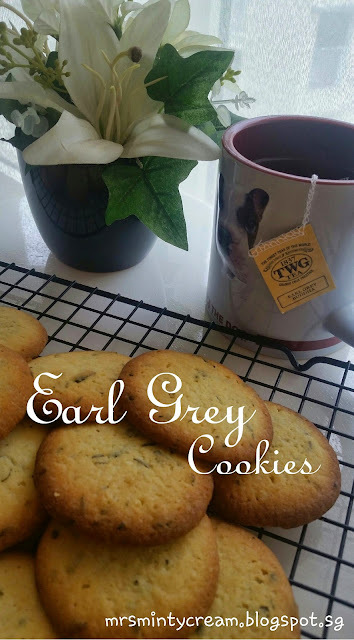 The recipe I chanced upon looked simple enough for me to give it a try and so, it was bookmarked. But then again, me being me, I just couldn't be contented with following the recipe alone and I had to give it a little spin of my own. Decided to replace basil with mint (and you wonder why this site is named as mrsMINTYcream?) and since I have these gorgeous mangoes sitting in my pantry, I decided to add them to my Lemon-Mint Granita. I don't believe there's anyone out there who doesn't like some sweet and gorgeous fruits to go with some good old citrus like lemon and lime. The end product was somewhat like a combination of ice-jelly cocktail and ice-kachang (minus the sugary syrup). Go make some granita and keep it in the freezer just because it is so versatile and can simply goes well with just about anything! 1. Wash and dry fresh mint leaves. Using a food processor or a blender, pulse the mint leaves until they are mostly pureed. Set aside for later use. 2. Boil the water and sugar to make a syrup. Stir well to ensure the sugar is dissolved. Set aside. 3. Combined and lemon juice with the lime juice. Stir in the zest of one lime into the mixture. 4. Add the mint leaves puree to the lemon-lime juice mixture and stir. Once combined, also add in the sugar syrup and taste. Adjust the mixture to the level of sweetness you desired by adding in more sugar if needed. 5. Pour the mixture into a freezable container and freeze for at least 4-5 hours. After every 1-2 hours, remove from freezer and flake it using a fork. 6. While waiting for the granita to freeze, prepare the fruits. Wash and diced all the fruits. If you do not have fresh fruits, you may also use canned fruits (without the canned syrup). 7. Place the fruits at the bottom of a serving cup/mug/bowl. 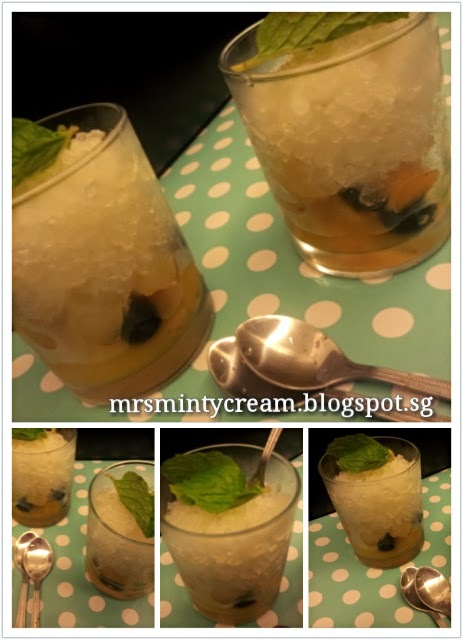 Top with the lemon-mint granita and mint leaves, then serve.